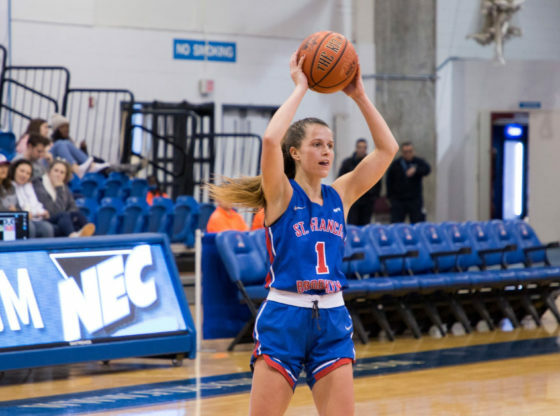 The St. Francis Women’s basketball team (11-9, 5-3 NEC) couldn’t continue their winning streak as they were defeated by the Mount St. Mary’s Mountaineers (10-9, 4-4 NEC) in a hard fought battle with the final score of 78-75. SFC went 8-19 (42%) in shooting in the first quarter and attempted to maintain a lead but couldn’t hold on as the Mount St. Mary’s Mountaineers went on a 7-1 run to give them a 7 point lead to end the first quarter. St. Francis showed that they were capable to stay in the game as they went on a 12-5 run in the beginning of the second quarter to give the Terriers the lead. Jade Johnson scored 11 points in the second quarter, which was insisted of 3 three-pointers and jump shot just a couple of inches short from the three-point line. Michaela Harrison on Mount St. Mary’s made a layup to beat the buzzer at the end of the first half to bring the Mountaineers down by only 1 point. The score of the game stayed relatively close with multiple lead changes and exchanges of three-pointers throughout the game. The Mountaineers knocked down 12 three pointers in the game which gave them the advantage over the Terriers. The Terriers had an opportunity to tie the game towards the end but were pressured by the defense of Mount St. Mary’s. Jade Johnson led the team once again in scoring as she finished with 25 points and 9 rebounds. She went 9-18 (50%) from the field and 5-9 (55%) from behind the three-point line. Maria Palarino scored 16 points (60% FG) along with 7 rebounds in the game. Maria scored over 1,000 career points tonight as a Terrier. Ally Lassen also finished with double-digit scoring as the finished tonight’s matchup with 12 points and grabbed 5 rebounds. Senior Juliette Lawless led Mount St. Mary’s scored 28 points while shooting 57% from the field and shot 4-6 (66%) from three. Sophomore Dayl Sullivan and Freshman Michaela Harrison scored 15 points each and combined for a total of 8 three pointers made. After this devastating loss tonight, the Terriers look to gain back their momentum as they take on the Pioneers of Sacred Heart this Saturday, February 2nd, at 1:00 pm.